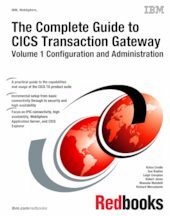 In this IBM® Redbooks® publication, you will gain an appreciation of the IBM CICS® Transaction Gateway (CICS TG) product suite, based on key criteria, such as capabilities, scalability, platform, CICS server support, application language support, and licensing model. Matching the requirements to available infrastructure and hardware choices requires an appreciation of the choices available. In this book, you will gain an understanding of those choices, and will be capable of choosing the appropriate CICS connection protocol, APIs for the applications, and security options. You will understand the services available to the application developer when using a chosen protocol. You will then learn about how to implement CICS TG solutions, taking advantage of the latest capabilities, such as IPIC connectivity, high availability, and Dynamic Server Selection. Specific scenarios illustrate the usage of CICS TG for IBM z/OS®, and CICS TG for Multiplatforms, with CICS Transaction Server for z/OS and IBM WebSphere® Application Server, including connections in CICS, configuring simple end-to-end connectivity (all platforms) with verification for remote and local mode applications, and adding security, XA support, and high availability.